MCDM AG.COM | JA N UA RY/ F EBRUA RY 2016 | Medical Construction & Design 19 Industry Charette members touring the Norwegian American Hospital. 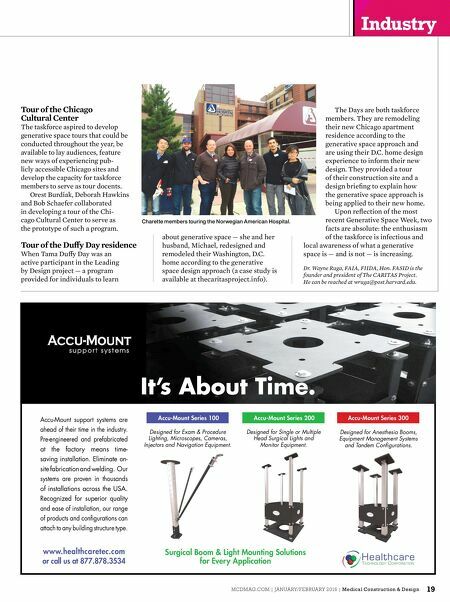 Accu-Mount support systems are ahead of their time in the industry. Pre-engineered and prefabricated at the factory means time- saving installation. Eliminate on- site fabrication and welding. Our systems are proven in thousands of installations across the USA. Recognized for superior quality and ease of installation, our range of products and confgurations can attach to any building structure type. www.healthcaretec.com or call us at 877.878.3534 Accu-Mount Series 200 Accu-Mount Series 100 Accu-Mount Series 300 It's About Time. Surgical Boom & Light Mounting Solutions for Every Application Designed for Exam & Procedure Lighting, Microscopes, Cameras, Injectors and Navigation Equipment. Designed for Anesthesia Booms, Equipment Management Systems and Tandem Confgurations. Designed for Single or Multiple Head Surgical Lights and Monitor Equipment. Tour of the Chicago Cultural Center The taskforce aspired to develop generative space tours that could be conducted throughout the year, be available to lay audiences, feature new ways of experiencing pub- licly accessible Chicago sites and develop the capacity for taskforce members to serve as tour docents. Orest Burdiak, Deborah Hawkins and Bob Schaefer collaborated in developing a tour of the Chi- cago Cultural Center to serve as the prototype of such a program. Tour of the Duf y Day residence When Tama Duf y Day was an active participant in the Leading by Design project — a program provided for individuals to learn about generative space — she and her husband, Michael, redesigned and remodeled their Washington, D.C. home according to the generative space design approach (a case study is available at thecaritasproject.info). The Days are both taskforce members. They are remodeling their new Chicago apartment residence according to the generative space approach and are using their D.C. home design experience to inform their new design. They provided a tour of their construction site and a design briefi ng to explain how the generative space approach is being applied to their new home. 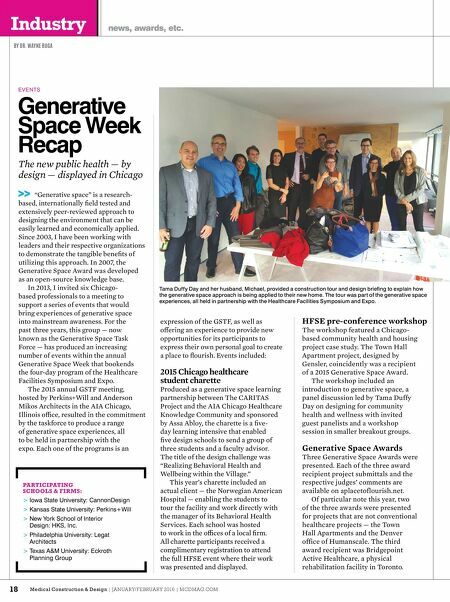 Upon refl ection of the most recent Generative Space Week, two facts are absolute: the enthusiasm of the taskforce is infectious and local awareness of what a generative space is — and is not — is increasing. Dr. Wayne Ruga, FAIA, FIIDA, Hon. FASID is the founder and president of The CARITAS Project. He can be reached at wruga@post.harvard.edu.